One of my first ever reviews was for Lucy Clarke's debut novel, The Sea Sisters. I adored that book and bought numerous copies for family and friends. It was one of my top reads of 2013 and I genuinely could not wait for her second novel. When this popped up in a prize pack from The W6 Book Cafe, I snuck it to the top of my reading pile and retired to my bedroom with an air of "Do Not Disturb" about me! Eva has lost her husband to a tragic drowning accident in England and feels a trip to his homeland, on a remote Tasmanian island, will help her come to terms with her loss and perhaps gain some insight into his past. She has never met his family and wants to know more about his life on the other side of the world. Unfortunately, things do not always turn out the way you expected, and Eva's whole experience of married life, and the depth of her feeling for her husband comes under question. How well did she really know Jackson? How much does she want to know now that he is gone? 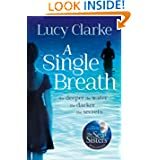 Lucy Clarke has written another novel full of intrigue and mystery. The descriptive passages are, yet again, to the forefront of the book as she has such an affinity with the ocean and the wild and wonderful way it can effect people. Each chapter is lovingly peppered with locations I can only dream of and she draws the reader into this world of unspoilt beaches, sun kissed skin and amazing sea creatures. I'm not a swimmer or a huge lover of the sea (despite growing up in a seaside village in Ireland) but yet I could almost feel the experience of free diving and snorkling, catching fish for dinner and shaking sand from my hair. The story of Eva and Jackson is a clever one, with a few twists and turns along the way and the character, Saul, sounds like every woman's idea of heaven.....Rugged, handsome and good with his hands! !